Bernie Sanders And Donald Trump Say The Voting System Is Rigged, Is It? This year's primaries have been filled with complaints about the voting process. The controversies raise questions about how confident Americans are that their votes will count in November. Ohio voters at the polls in Cincinnati for the state's primary on March 15. This week, as part of the Nation Engaged project, NPR and some member stations will be talking about what the 2016 primary season has revealed about voters' confidence in the American electoral system. 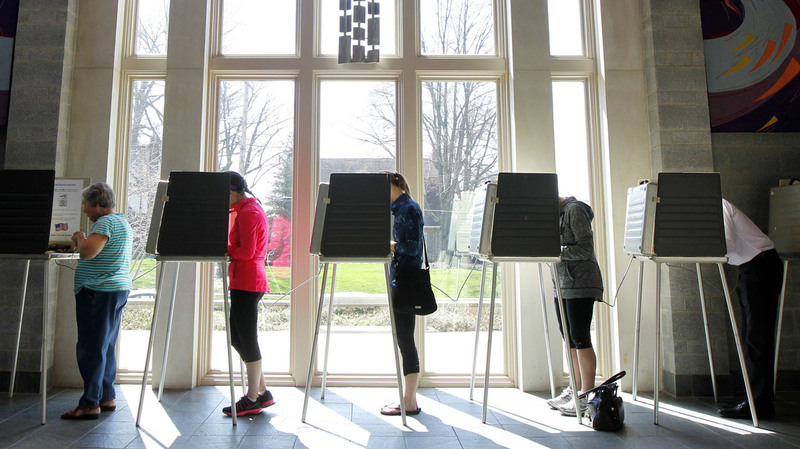 This year's primaries have been filled with complaints about the voting process. Voters in Arizona were furious that they had to wait up to five hours to cast ballots. Thousands of New Yorkers had their names mistakenly dropped from voter registration rolls. Republican candidate Donald Trump called his party's nominating system "rigged." Bernie Sanders said the Democrats' nominating system was "dumb." Ultimately the legitimacy of government rests on the belief among the losers that it was a fair fight. And many state voting laws, like strict new photo ID requirements, faced court challenges by those who said they would block minorities and other voters from participating in the election. Supporters defended the laws as necessary to prevent fraud at the polls. All this controversy has left many voters uneasy, and raised questions about how confident Americans are that their votes count, and will be counted accurately in November. So far at least, voters do seem to have faith that the system works. Most say they're confident — at least somewhat — that their votes will be counted correctly. Charles Stewart, a political scientist at MIT, says that's crucial in a democracy. "Ultimately the legitimacy of government rests on the belief among the losers that it was a fair fight," he says. Stewart has asked voters for years about their experiences at the polls. And he's found, for the overwhelming majority of voters, things go surprisingly well. In surveys after the 2012 and 2014 elections, at least 97 percent of voters said their polling places were run "very well." Most people waited less than 10 minutes to vote. Very few people had problems with voting machines. And 90 percent or more said they were very or somewhat confident that their ballots were counted as cast. But Stewart says a voter's view also depends on whom they voted for. Supporters of Democratic presidential candidate Bernie Sanders rally in New York City on Jan. 30. "People who are on the winning side of elections are much more confident about all aspects of the election," he says. The losers are less confident, in part because it's one way to justify their loss. Stewart also says that while most voters have confidence in their own polling places, they're not so sure when it comes to those in the rest of the country. Lonna Atkeson, who directs the Center for the Study of Voting, Elections and Democracy at the University of New Mexico, says voters are also greatly influenced by what the candidates say. That's especially true this year, with all the uproar over the primary system. "No average person has any idea how that operates," says Atkeson. "And so when the candidates get up and say, 'Hey, this isn't a fair process,' I mean, those are cues to their voters that there's something wrong with the process. And so people are going to be responsive to those messages." That might help explain the findings of a poll in May by the Associated Press and the NORC Center for Public Affairs Research. While most voters said they had at least some confidence that their votes would be counted accurately, 1 in 4 said they had hardly any confidence at all — an unusually high number. This undercurrent of voter discontent was evident recently outside the National Archives building in Washington, D.C., where people waited in long lines to see the U.S. Constitution and vendors hawked Donald Trump and Hillary Clinton T-shirts, at $10 apiece. Ashley and Patrick Saxe were visiting from Little Suamico, a small town near Green Bay, Wis. Ashley says she was extremely frustrated when she went to her local election office to vote early, only to be told to come back later. "I just don't understand why it's so hard. I was right there, that she just couldn't hand me an absentee ballot so I could do it," says Ashley. "It just kind of adds on to this bottled anger that I think a lot of people have to make it more difficult to vote." Patrick Saxe says he's concerned about the fairness of the state's new voter ID requirement. He thinks it hurts minorities and others who might have a difficult time getting a government-issued photo ID. But sitting nearby, Cheryl Ward of Charlottesville, Va., is more worried the rules aren't tight enough. "You know there's so much fraud," she says. "Voter ID is under attack." Even though evidence of fraud at the polls is scarce, the stories persist. Ward says she can't point to any particular problem, but she's just not sure her vote matters any more. "I think they put in the White House whoever they want to really," she says, adding that there's only a fifty-fifty chance she'll vote this November. Cheryl Beckman of Madison, Wis., plans to vote, but is confused whether it will make any difference in the end. "I'm not real sure how it counts in with the Electoral College. That process has never been explained very well," says Beckman, who thinks the president should be elected by popular vote. Some of this unease over voting is a reflection of widespread public frustration with government and politics in general. The AP-NORC poll found that only 10 percent of Americans have a great deal of confidence in the overall political system. Still, more than half have "some" confidence. And if nothing else, voters outside the National Archives hope the process works and is fair. Josh Daniels of Columbus, Ohio, says he has faith in the system, in part because he has no reason to feel otherwise. He's never had any problems at the polls. But he says it helps that there's a paper backup in his voting machine, just in case there are any questions about the electronic results. Still, Daniels is disturbed by what he sees happening elsewhere in the country, such as the long lines and voters finding that they've been dropped from the rolls. 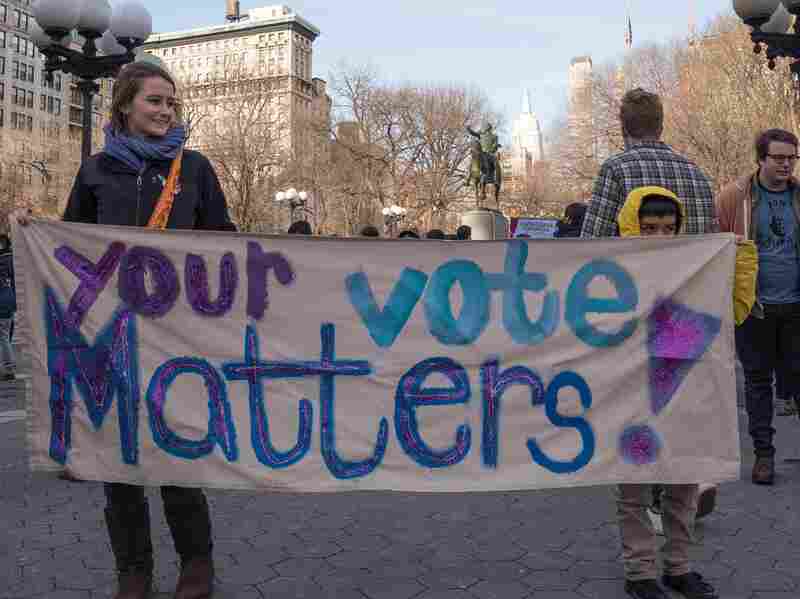 "Everyone should have their vote counted if they're eligible to vote, absolutely. It should be uniformly smooth for everybody across the country," he says. With 130 million people showing up at tens of thousands of different polling sites, that's highly unlikely. But Atkeson, from the University of New Mexico, says those running elections need to make things run as smoothly as possible, because good customer service will go a long way toward easing voter anxiety. "If you have poor interactions with poll workers, or you have a problem with your ballot, or maybe you're a provisional voter, all of these things matter to your feelings about your vote being counted correctly," she says. And, she adds, whether you think in the end that the winner won fair and square.